View of the center of Ilijaš. Ilijaš (Serbian Cyrillic: Илијаш) is a town and municipality located in Sarajevo Canton of the Federation of Bosnia and Herzegovina, an entity of Bosnia and Herzegovina. It is located north-east of the inner city of Sarajevo and was established in May 1952 with the organization of people’s committees. Those local people’s committees founded the local municipalities, which led to self-management of the municipalities, including the municipality of Ilijaš. In the early Middle Ages close to the river Bosna and Vogoščica the district Vogošća or Vidogošća was formed. Some later events that are tied to the Ottoman period came to the formation of džemats, nahiyahs and sanjaks. In the beginning of the nineteenth century there were 20 džemats in the Sarajevo Nahiyah: Butmir, Kijevo, Presjenica, Sudići, Trnovo, Zijamet Crna Rijeka, Pale, Mokro with Bobogovićima, Kriva Rijeka, Srednje, Čifluk Crna Rijeka, Rakova Noga, Vogošća, Nahorevo, Kulijes, Rakovica, Hadžići, Drozgometva, Pazarić and the villages of Luka i Žeravica. The occupation of Bosnia and Herzegovina by the Austro-Hungarian Empire led to many changes which manifested to administrative and political changes. The territory of Bosnia and Herzegovina was divided into districts and further divided into counties. The counties were divided into municipalities, instead of dzemats, and they were furthermore divided into mahallahs and hamlets while the functions of the muhtars and village chiefs remained the same. The modern municipality of Ilijaš at that time was divided into the Sarajevo and Visoko counties and the boundary line between these two counties was the Povučje stream and the hill Bukovac which was between the stream and Ljubina. The administrative division of Bosnia and Herzegovina until the formation of bans in 1929 remained the same even during the Austro-Hungarian occupation. Only after 1922 oblasts were formed instead of districts. Everything remained the same until 1941. Right after the freeing of the temporary national assembly of the Federal Bosnia and Herzegovina the assembly’s first session in August 1945 brought up the law of the territorial division of Bosnia and Herzegovina in districts, counties and areas of local people’s committees and their headquarters. 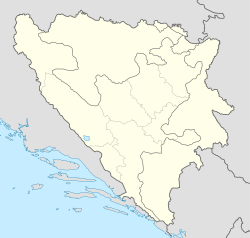 The municipality of Ilijaš is composed of two parts, the town of Ilijaš and the upper municipality. The town of Ilijaš is composed by several localities. The biggest and most urban is the center and it has about 10,000 residents, the second is the settlement of Misoča (Naselje Misoča), with 1500 residents. Ethnically, there is a majority of Bosniaks with about 1300 people, 250 are Serbs, 50 are Croats, with none classified as others. Other places, of the municipality of Ilijaš, are Podlugovi, Lješevo, Stari Ilijaš and Malešići. According to 1971 population census there were 23,007 residents. According to 1991 population census there were 25,184 residents. ^ * Official results from the book: Ethnic composition of Bosnia-Herzegovina population, by municipalities and settlements, 1991. census, Zavod za statistiku Bosne i Hercegovine - Bilten no.234, Sarajevo 1991. Ilijaš - Official website of the town. Wikimedia Commons has media related to Ilijaš. This page was last edited on 8 August 2018, at 09:56 (UTC).